Al-Mutran Guest House i Nazareth, Israel: Reservér nu! The Al Mutran Guest House is a 200 year-old Arab mansion turned guest house that offers private rooms as well as dormitory rooms in a unique old-world atmosphere. 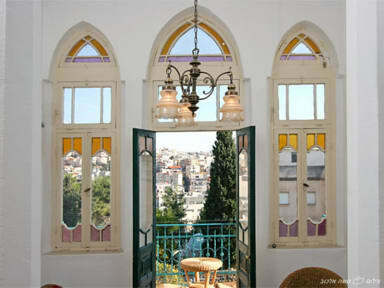 The Guest House is located in the heart of the Old City. Just a few minutes' walk from excellent restaurants and coffee shops, you are never far from your destination. The Basilica of the Annunciation is a short walk away, through the charming narrow streets of the souq (market). The Al Mutran Guest House was the mansion of the Kattouf family, famous for their quality jewelry and handmade gold, gemstone and diamond products.